This section contains information about ongoing plan administration, such as what you need to do when a plan participant has changed his or her name or mailing address. Processing these changes in a timely manner is important because they can have specific implications and affect the participants’ results and experiences. As Plan Administrator, you will need to send the new and correct information to the Program for processing by completing and submitting the appropriate administrative form. This section provides a detailed description of your role, as well as that of the plan participant and the Program. In the chart below, you will find the steps for processing participant information changes. A change in employment status may affect the participant’s eligibility for participation or contributions. For example, your plan may determine eligibility to receive year-end employer contributions based on hours of service. A change to part-time employment could reduce the participant’s hours below the number required to share in that year’s contribution allocation. The reverse can also be true; going to full-time employment may mean you have a participant who is now eligible for employer contributions. You will need to refer to your firm’s adoption agreement to see what types of changes may have an effect on your plan administration. For termination or retirement, the Program needs the participant’s home address (if not previously provided) and date of termination, which should be provided on the Participant Data Change Form. Note that the term “participant” will continue to include anyone who has terminated or retired, so long as that individual continues to maintain a balance in your plan. When a plan participant changes his or her name, you must notify the Program by completing and submitting a Participant Data Change Form, and provide the legal documentation (e.g., copy of marriage certificate or copy of the divorce decree or court order). When a plan participant changes his or her current mailing address, you may complete and submit a Participant Data Change Form to notify the Program as soon as possible. Alternatively, the participant may log on to his or her account or call the Customer Service Center at 800.348.2272 to update an address. You must inform the Program with a Participant Data Change Form when a plan participant marries, divorces or becomes widowed, and provide legal documentation (e.g., marriage certificate, divorce decree). Remind the participant that since a marital status change occurred, it affects the participant’s beneficiary designation, so the participant may want to review his or her named beneficiary for the plan. To change his or her beneficiary designation, the participant should complete a Beneficiary Designation Form. 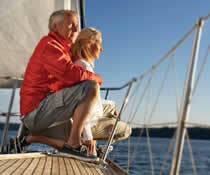 To request a change in beneficiary, the participant must complete a Beneficiary Designation Form. If the participant is married and wants to name someone other than his or her spouse, the spouse needs to give consent. An Authorized Plan Representative or notary public must witness the spouse’s signature. The date of the witness’s signature must be the same date as the spouse’s signature. D. Authorized plan representative signs and date the form on behalf of the employer. The participant must also sign and date the form. For termination or retirement, you must notify the Program of the participant’s termination or retirement date by using a Participant Data Change Form. Note: Most of the changes, such as employment status, marital status, name change and address change, that can be requested with the Participant Data Change Form can be made online using the Payroll/Administration feature of Sponsor Web. 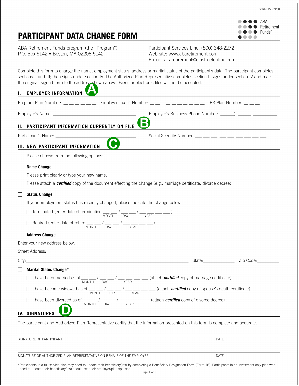 For a beneficiary change, once you receive the participant’s completed Beneficiary Designation Form, you must sign and date it as the Authorized Plan Representative in Section 4. Submit the completed form to the Program using one of the methods provided under “Mail & E-mail” in the Forms, Tools and Resources section of the Guide. The Program will process the form(s) upon receipt and send a confirmation notice to the participant’s address of record.